INVISIBLE-EXPORTS is proud to present Matthew Porter’s “Sunclipse,” the artist’s third exhibition with the gallery. The photographs that make up the exhibition are marked, as always with Porter, by exquisite technical control, and yet they also demonstrate the dark romanticism of once-glowing visions of the future gone slightly dim. 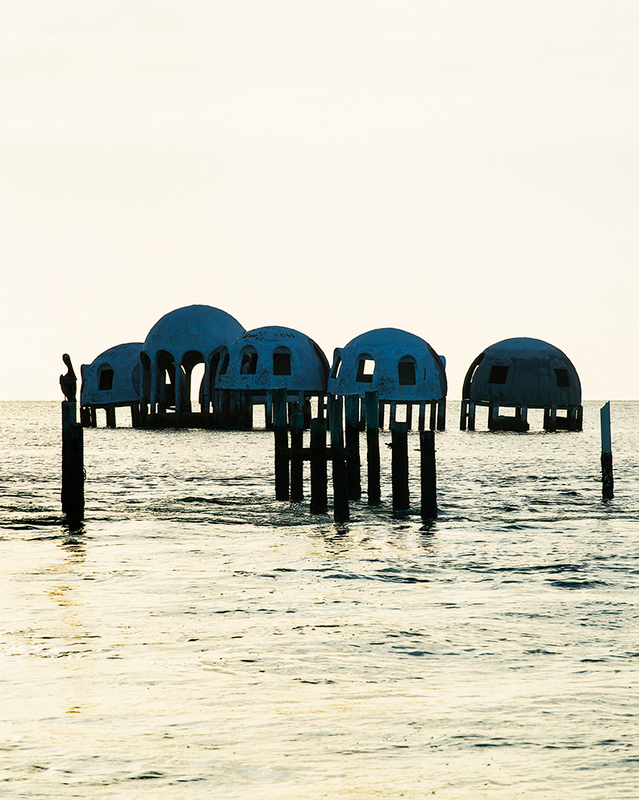 The exhibition is organized around images of a dome house built in Cape Romano, Florida. Conceived and constructed by oil baron Bob Lee in 1980, the complex was not designed to be an experiment in utopian living but simply an extravagant vacation home that partook of the aesthetic vanguard developed by dreamers like Fuller (a familiar legacy, from radicalism to luxury architecture). And yet, pummeled by one hurricane after another throughout the 1980s and 1990s, it became a climate-battered ruin as surely as any semi-colonialist effort to build modern (and modernist) utopias in and around the world’s deserts and jungles (as in Henry Ford’s Brazilian Fordlandia or Paolo Soleri’s Palm Springs Arcosanti). It’s an act of hubris, to present a sandy shoulder against the ocean’s bite. The former is always in retreat against the latter. Also included in the exhibition are photographs of a frigate bird; with its hollow bones and 4 foot wingspan, it’s known to live into its 40s, and can soar at high altitudes for weeks on the damp currents that form clouds. With its distinct profile and prehistoric features, its presence here feels foreboding—a harbinger of defeat brought on by the buoyant optimism and inspired folly of those on the ground. Matthew Porter (b.1975, Pennsylvania) received his BA from Bard College in 1998 and his MFA from Bard-ICP in 2006. Porter was profiled in The New York Times and included in the “After Photoshop” exhibition at the Metropolitan Museum Art (New York, 2012), as well as the International Center of Photography Museum’s “Perspectives 2010.” He is currently participating in “A Matter of Memory” at the Eastman Museum in Rochester, and his first monograph, Archipelago, was published by Mack Books in 2015. His work is included in the permanent collection of The Metropolitan Museum of Modern Art. Porter lives and works in Brooklyn, New York.